By creating an account and/or using 123DivorceMe ("the software and service"), you agree to, and acknowledge that you understand, the Terms and Conditions of Use set forth below. IF YOU DO NOT AGREE WITH THESE TERMS AND CONDITIONS OF USE AND DO NOT WISH TO BE BOUND BY THESE TERMS AND CONDITIONS OF USE, DO NOT USE 123DIVORCEME. BY USING 123DIVORCEME YOU AGREE THAT YOU ARE AT LEAST 18 YEARS OF AGE, ARE LEGALLY ABLE TO ENTER INTO A CONTRACT AND AGREE TO THESE TERMS AND CONDITIONS OF USE. THESE TERMS AND CONDITIONS OF USE FORM A BINDING AGREEMENT BETWEEN YOU AND LINEAGE SOFTWARE, INC. PLEASE NOTE THAT THIS AGREEMENT PROVIDES FOR THE MANDATORY ARBITRATION OF DISPUTES AND INCLUDES A WAIVER OF THE RIGHT TO A JURY TRIAL AND CLASS ACTION WAIVER AS SET FORTH BELOW. This is a quality nonlawyer self-help divorce solution. The 123DivorceMe Documentation software and service is not a substitute for the advice of a lawyer. Lineage Software, Inc. does not practice law and does not give out legal advice. The software and service allows you to represent yourself in doing your own uncontested divorce. If you need or desire legal representation, have a contested divorce, or have complex legal issues that cannot be resolved on your own, we recommend that you hire a lawyer. Because of the possible unanticipated changes in governing statutes and case law relating to the application of the information contained within this software and service, the authors and creators and any and all persons or entities involved in any way in preparation of the website, application, software and service disclaim all responsibility for the legal effects or consequences of the interpretation of the information and/or documents. Individuals intending to use the website, application, software and service as an information resource and document preparation tool are doing so on their own behalf without representation of a lawyer in a "do it yourself" pro se fashion. Your use of the software and services does not create a lawyer-client relationship between you and Lineage Software, Inc., or between you and any Lineage Software, Inc. employee or representative. Lineage Software, Inc. does not review for accuracy and/or file any document with the court on your behalf, nor does it pay any associated court or filing fees. By using the software and service you will be preparing the most common documents and procedures used to file for an uncontested divorce, one where both parties are in agreement and both are willing to sign the documentation. There is no guarantee that the documentation provided through the software and service is ideal or perfect for your specific situation. The documents provided through the use of the software and service is consistent for all users. 123DivorceMe is offered with a peace-of-mind 100% guarantee. Lineage Software, Inc. offers a 100% guarantee that the documents will be accepted by the court. In the event that the documents are rejected by the court due to the fault of Lineage Software, Inc. and you are no longer able to get your divorce, you will be provided a 100% refund (with no handling fee). Verification of any denial of acceptance or a rejection notice from the court may be requested. It is in our support staff's nature to take the time and opportunity to give each individual customer personal attention should they have difficulty using the software. We have both e-mail and phone product support (1-800-340-9221 Mon - Fri 9 am -5 pm EST). Since 123DivorceMe is a software and service type product all refund requests are reviewed individually. Lineage Software, Inc. expressly reserves the right to terminate your account (including your user name and password) and any other agreements you may have with Lineage Software, Inc. at any time and to refuse service to anyone. YOUR USE OF THE INFORMATIONAL CONTENT PROVIDED BY THIS SERVICE IS AT YOUR SOLE RISK. THE INFORMATIONAL CONTENT IS PROVIDED ON AN "AS IS" AND "AS AVAILABLE" BASIS. LINEAGE SOFTWARE, INC. EXPRESSLY DISCLAIMS ALL WARRANTIES OF ANY KIND, WHETHER EXPRESS OR IMPLIED, INCLUDING, BUT NOT LIMITED TO THE IMPLIED WARRANTIES OF MERCHANTABILITY, FITNESS FOR A PARTICULAR PURPOSE AND NON-INFRINGEMENT. LINEAGE SOFTWARE, INC. MAKES NO WARRANTY THAT (i) THE INFORMATION CONTENT WILL MEET YOUR REQUIREMENTS, (ii) THE INFORMATIONAL CONTENT WILL BE UNINTERRUPTED, TIMELY, SECURE, OR ERROR-FREE, (iii) THE RESULTS THAT MAY BE OBTAINED FROM THE USE OF THE INFORMATIONAL CONTENT WILL BE ACCURATE OR RELIABLE. YOU EXPRESSLY UNDERSTAND AND AGREE THAT LINEAGE SOFTWARE, INC. SHALL NOT BE LIABLE FOR ANY DIRECT, INDIRECT, INCIDENTAL, SPECIAL, CONSEQUENTIAL OR EXEMPLARY DAMAGES, INCLUDING BUT NOT LIMITED TO, DAMAGES FOR LOSS OF PROFITS, GOODWILL, USE, DATA OR OTHER INTANGIBLE LOSSES (EVEN IF LINEAGE SOFTWARE, INC. HAS BEEN ADVISED OF THE POSSIBILITY OF SUCH DAMAGES), RESULTING FROM: (i) THE USE OR THE INABILITY TO USE THE INFORMATIONAL CONTENT; (ii) THE COST OF PROCUREMENT OF SUBSTITUTE GOODS AND SERVICES RESULTING FROM ANY GOODS, DATA, INFORMATION OR SERVICES PURCHASED OR OBTAINED OR MESSAGES RECEIVED OR TRANSACTIONS ENTERED INTO THROUGH OR FROM THE INFORMATIONAL CONTENT; (iii) UNAUTHORIZED ACCESS TO OR ALTERATION OF YOUR TRANSMISSIONS OR DATA; (iv) ANY OTHER MATTER RELATING TO THE INFORMATIONAL CONTENT. 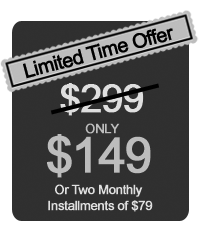 If you select the 2 monthly installment payment option, you shall pay $79.00 to begin using the software and service and agree to allow Lineage Software, Inc. to automatically charge your credit card an additional $79.00 at least one month from the initial charge date. Choosing the installment payment option does not limit your usage of the software and service. If Lineage Software, Inc. is unable to collect the additional monthly payments in a timely fashion, it has the right to suspend the account and reserves the right to collect on any unpaid fees through an independent collection agency. It is in our support staff's nature and a company policy that we take the time and opportunity to give each individual customer personal attention should they have difficulty using the software service. We have both e-mail and phone support (1-800-340-9221 Mon-Fri 9 am -5 pm EST). We are not lawyers and do not provide legal advice of any kind. If you need legal advice we recommend that you hire a lawyer. Lineage Software, Inc. will not sell, rent or lease your personally identifiable information. We respect your privacy. Lineage Software, Inc. does reserve the right to provide relevant account information to resolve fraudulent, unauthorized, or charge disputes associated credit card companies and/or our credit card processors as well as any legal related matters. If you have a dispute with Lineage Software, Inc. regarding the 123DivorceMe software and service, and you are unable to resolve the dispute informally, you and Lineage Software, Inc. agree that upon demand by either you or Lineage Software, Inc., the dispute will be resolved through binding arbitration. A "dispute" is any unresolved disagreement between you and Lineage Software, Inc., regardless of when the claim arose, and includes claims based on contracts, torts, statutes, regulations, common law, and equitable claims. All statutes of limitation applicable to any dispute shall apply in any arbitration between you and Lineage Software, Inc..
Each arbitration, including the selection of the arbitrator, will be administered by the American Arbitration Association (the "AAA") according to its Commercial Arbitration Rules and the Supplementary Procedure for Consumer-Related Disputes (together, the "AAA Rules"). The AAA Rules are available online at www.adr.org, or by calling the AAA at 1-800-778-7979. In the event of any inconsistency between the AAA Rules and this arbitration provision, this arbitration provision shall be controlling. Either party may demand arbitration by completing the form for Consumer-Related Disputes provided for that purpose, and following the instructions on the form. The form is available on the AAA's website, www.adr.org, or by calling AAA Case Filing Services at 1-877-495-4185. You should attach a copy of this arbitration provision, which will remain available online. If you demand arbitration, you must send a copy of the form or other demand, by U.S. Certified Mail, addressed to: Lineage Software, Inc., 369 Long Cove Dr., Hilton Head Island, SC 29928. If Lineage Software, Inc. demands arbitration, you will be sent a copy of the form or other demand, by U.S. Certified Mail, at the most current postal address that Lineage Software, Inc. has for you in its records. Except as otherwise provided by applicable law, each party will remain solely responsible for their own attorneys' fees and expenses incurred in connection with the arbitration. You and Lineage Software, Inc. agree that: (1) the parties are participating in transactions affecting interstate commerce; (2) this arbitration provision and any resulting arbitration are governed by the Federal Arbitration Act (Title 9 of the United States Code); (3) the arbitrator shall decide any dispute regarding the interpretation, application, or enforceability of this arbitration provision; (4) neither party will disclose, to any third party, any information obtained from the other party in the arbitration proceeding, except as required by applicable law; and (5) neither party will be entitled to rely on any arbitration award, finding of fact, or conclusion of law issued in any other arbitration proceeding involving only one of the parties. This arbitration provision shall survive the termination of any other contract between you and Lineage Software, Inc.. These Terms and Conditions of Use constitute the entire agreement between you and Lineage Software, Inc. with respect to the subject matter of these Terms and Conditions of Use, and supersede and replace any other prior or contemporaneous agreements, or terms and conditions applicable to the subject matter of these Terms and Conditions of Use. These Terms and Conditions of Use create no third party beneficiary rights. 123DivorceMe exists solely within the Beaufort County in the State of South Carolina. You agree that regardless of where you reside or where your browser is physically located, your viewing of 123DivorceMe occurs solely within Beaufort County in the State of South Carolina and that all content, software and services shall be deemed to be served from and performed wholly within, Beaufort County, South Carolina, as if you had physically traveled there to obtain such service. These Terms and Conditions of Use will be governed and interpreted pursuant to the internal laws of the State of South Carolina, United States of America, notwithstanding any principles of conflicts of law. You specifically consent to personal jurisdiction in South Carolina in connection with any dispute between you and Lineage Software, Inc. arising out of these Terms and Conditions of Use or pertaining to the subject matter hereof to the extent an arbitrator does not have jurisdiction. You agree that the exclusive venue for any dispute between the parties arising out of these Terms and Conditions of Use or pertaining to the subject matter of these Terms and Conditions of Use will be in Beaufort County, South Carolina and federal courts in South Carolina to the extent an arbitrator does not have appropriate venue.